As a big fan of apps that bring the world to your fingertips, I’m very excited for the new FREE version of SkyView. 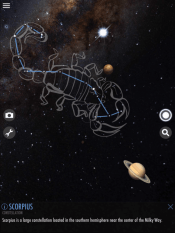 With this app students can point their device towards the sky and see where stars, planets and constellations are located. Users can access extra information on each celestial body and activate the augmented reality mode. Whether you have students list their questions about astronomy or conduct research on a constellation of their choice – this app is a great way to grab your students attention and give them access to outerspace! Here are some QR Code scavenger hunts for exploring informational text!